Newspaperman, Born, Easton PA, July 28, 1941; died, West Caldwell, NJ, Oct. 26, 2010. Bill Shannon. (Newspaperman. Born, Easton, Penna., July 28, 1941; died, West Caldwell, N.J., Oct. 26, 2010.) 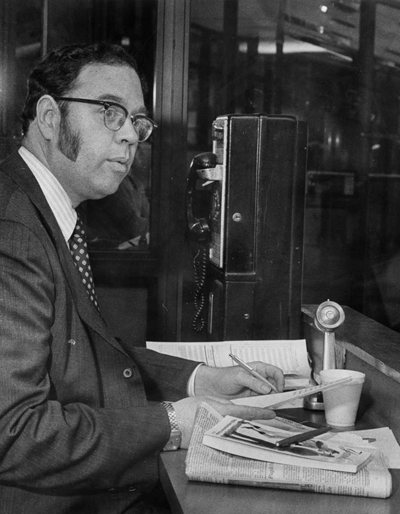 A prolific author, wire service sports reporter, long-time Major League Baseball official scorer, football statistician, sports museum founder, theatrical agency owner, and public relations head for two Madison Square Gardens, William Oliver Shannon, Jr., was, oddly enough, perhaps known as much for his quirks as his deeds. A tall, broad, friendly, garrulous man and Anglophile easily distinguished by his muttonchops, thick glasses, booming voice, and chain smoking, Shannon possessed an encyclopedic knowledge of seemingly everything, especially baseball, the railroads, theatre, and opera. Born in Easton, Penna., to parents who lived in Richmond Hill, N.Y., Shannon moved to Hammond, Ind., where he started covering high school sports, including games in which he played, for The Hammond Times at 13. His family moved to New Jersey when he was in high school, and he was graduated by Bergenfield (N.J.) High School in 1959. As a senior, he was named New Jersey’s high school journalist of the year. Rebuffing his father’s entreaties to go to Rutgers, he attended Columbia. And rather than enjoy the typical college experience, he spent much of his time working in the Columbia sports information office, at the Garden, for various New York newspapers (as a stringer), and for the embryonic New York Titans. In 1960, Shannon convinced owner Harry Wismer to hire him, and the rest of the Columbia football stats crew, to handle Titans home game statistics, beginning his 51-season association with the team. Shannon himself served in numerous capacities on the crew, mostly as press box announcer. After a two-year stint in the Army, based primarily in Fort Eustis, Va., where he earned a letter of commendation for helping conduct the 1965 Army Track & Field trials and another for his contributions to the production of Damn Yankees, he joined the Garden, then a public company, as the head of public relations. While he was there, the Garden moved from Eighth Avenue between 49th and 50th Streets to its current location atop Pennsylvania Station. During his tenure, which ended in 1973, he oversaw, among other things, the Garden’s promotion of the U.S. Open tennis championships starting in 1968. In the mid-1970s, Shannon bought an interest in Bill Doll, a theatrical public relations agency, and wrote (with George Kalinsky, a photographer he had earlier hired at the Garden) a seminal book on baseball stadia, The Ballparks, published in 1975. Shortly thereafter, he determined to cover baseball more or less regularly, and after a couple of years writing for, among other publications, News of the World (sometimes referred to as The Daily Moon), he settled in to working for United Press International. In 1979, he served as an official scorer for the first time. In 1981, in conjunction with the 100th birthday of the U.S. Tennis Association, he compiled the U.S. Open Record Book and the centennial edition of the Official Encyclopedia of Tennis. Shannon began covering baseball for the Associated Press in 1984 and, each year for the rest of his life, worked over 150 Yankees and Mets games, enhancing his reputation for cheerful generosity with assistance to anyone on anything. In 1983, he became executive editor of Sports Information Data Base, a public company devoted to compiling statistics for all sports, major or minor. SIDB, too far ahead of its time in aggregating and disseminating sports information statistics in what is now commonplace fashion, went bankrupt two years later. Shannon’s next project, launched in 1989, was the New York Sports Museum & Hall of Fame, an educational institution created to build, in Manhattan, a museum of the history of New York-area sports. He served as president until his death. His final published book, Official Scoring in the Big Leagues (2006), was the first of its type, detailing, in classic Shannon style, the history of scoring and scorers, and the processes scorers use in making and communicating calls.